You can STACK ONE Manufacturer coupon and ONE Family Dollar coupon per ITEM in a transaction. Family Dollar does NOT pay overages. Coupons will be valued down. All Family Dollar coupons must have a scannable barcode or valid promotion code. 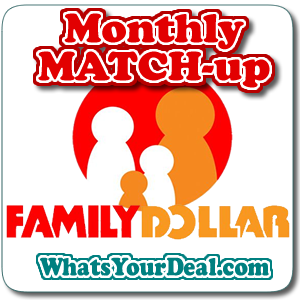 Family Dollar does NOT accept competitor coupons. Family Dollar $5 off $25 coupon is accepted as long as the net purchase, AFTER all other offers, coupons and/or discounts have been applied is $25 or more. There are currently no items in this list.